Much of the technology that defines modern life has origins in mathematical discoveries. This includes everything from the computers we use to the streaming videos we watch on our cell phones to the fact that we can order just about anything online and have it delivered within a few days. 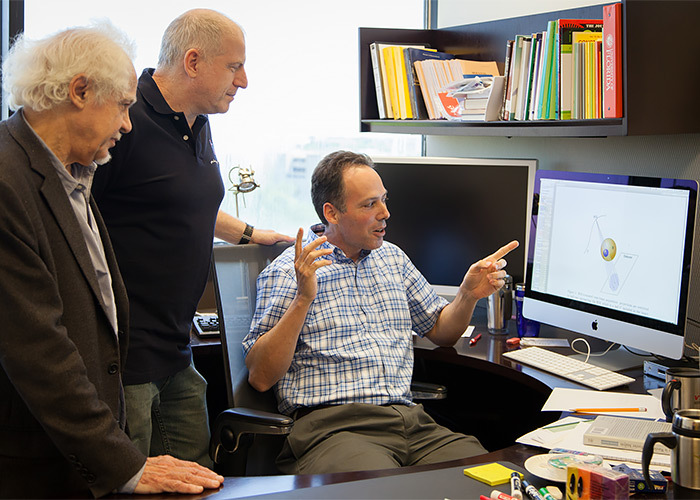 Mathematics faculty members (from left to right) Robert Azencott, Demetrio Labate and Bernhard Bodmann are collaborating on a region-of-interest CT project that aims to reduce X-ray exposure in patients.Computed tomography (CT) scans are no exception. The mathematics of tomography, which proved to be essential to the development of the first CT scanner in the 1960s, was worked out in 1917 by the mathematician Johann Radon. In a continuation of this legacy, faculty in the Department of Mathematics at the University of Houston are working on research that aims to lessen a patient’s exposure to X-rays during CT scans. This research was started by Robert Azencott, professor of mathematics, in collaboration with Bernhard Bodmann, associate professor of mathematics, and the radiology department at Houston Methodist Hospital. Later, Demetrio Labate, professor of mathematics, joined the project. Their approach attempts to reduce X-ray exposure using a method called Region-of-Interest Tomography. CT scans work by having an X-ray source rotate around a patient, collecting hundreds of two-dimensional projections on a detector located on the opposite side. Using mathematical techniques, this information can be used to construct a three-dimensional image. As powerful as CT scans are as a diagnostic tool, one scan is roughly the equivalent of 300 conventional X-ray exams, which poses another type of problem. The rationale of Region-of-Interest Tomography is simple: to cut down on X-ray exposure, only image the region that you are interested in, a concept called region-of-interest reconstruction. However, the mathematical tools required to accomplish this are anything but simple. “Mathematically speaking, region-of-interest reconstruction is a difficult problem,” Azencott noted. “When you try to reconstruct information based on a minimum number of projections, these inverse problems become what mathematicians call ‘ill-posed,’” Labate explained. Ill-posed is when the solution is not unique or when it is highly sensitive to changes in the data. This may happen when there isn’t enough information to rule out the extra solutions. With CT scans, the accuracy of the image begins to deteriorate when there aren’t enough images from different angles. Azencott, Bodmann and Labate are working around this limitation with region-of-interest reconstruction. For example, if a physician only needs a high-quality image of the kidney, then assuming a coarse estimate of the properties of the surrounding organs – the liver, stomach and spine – might be enough to rule out those extra solutions that would make tomographic reconstruction unstable. This assumption would allow a high-quality image of the kidney while using X-ray radiation restricted to the region of interest only. This research received funding from Houston Methodist Hospital.